You can import information in bulk by importing a Microsoft Excel spreadsheet in XLS format. The word New Info signifies start of a new information. The cell next to it should have the name of the information. 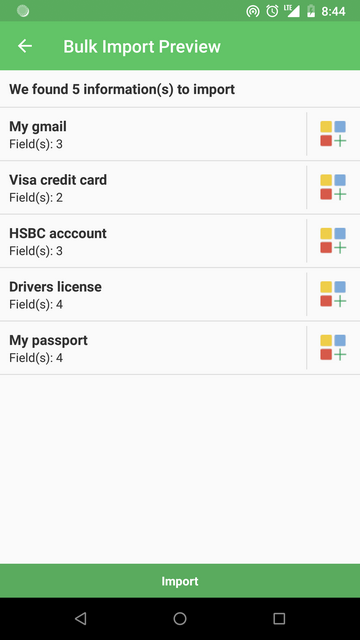 The rows below that should have pairs of field labels and values. 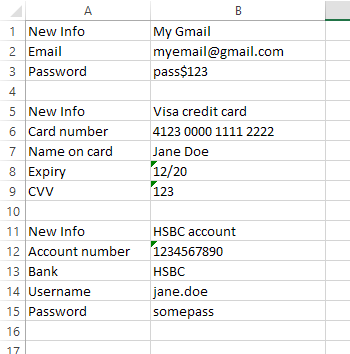 For instance, here is how you import data about an email id, credit card and bank account. Create an Excel file in this format, save it as .XLS and import it in HexaVault, or download a sample file and edit it. Save the file as XLS only, not XLSX, CSV, ODT or any other format. 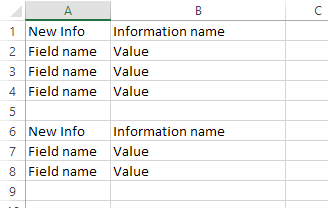 Make sure the data you enter in the cells is formatted as text. Otherwise, Excel will format the data as number, currency or date and result might not be what you expect. Here's how you can format data as text. The data should be entered only in the first worksheet in the Excel file. Data entered in any other sheet will be ignored and not imported. After you have created a file in this format, copy it on your device. Go to HexaVault and select the Import Information option from the menu. Select the XLS file with data and import. HexaVault will show you a preview of the information it will be importing. You can also specify an icon for each information on this screen. If you find everything in order, you can continue by tapping the Import button and the information will be imported to your vault.